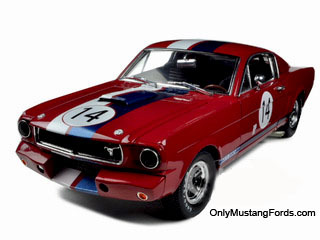 What's your favorite Mustang diecast car? 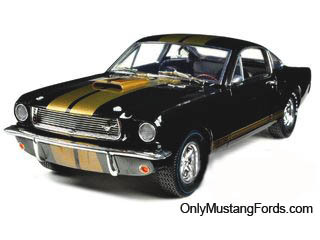 There are many more choices of diecast Mustang models than you'll see at local stores. While we may never have enough garage space to own every full size Ford Mustang we like, we can certainly find the room for our favorites in a diecast pony car. And at prices starting around $12.99, they make awesome gifts for that special someone! Click the blue links for more information. Lots of fine details, like these jewel like wire wheels on this silver 1964 1/2 Ford Mustang Hard Top in 1/18 scale. 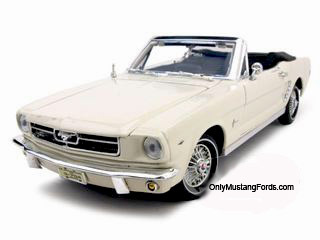 If you prefer a convertible, this 1964 1/2 Ford Mustang Convertible Diecast Model in Wimbledon White could be just what you're looking for! However, if your tastes dictate a dark black car, this gloss black 1964 1/2 Ford Mustang Convertible is perfect in 1/18 scale and beautifully detailed. Here are some great new 1965 models just in time for the holiday season! 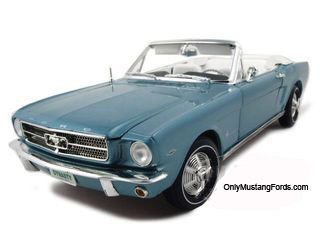 The 1965 model year, or later 1964 production, signaled some cool new additions to the iconic pony car, including the 1965 Mustang Fastback also known as a 2+2. This icon is painted dark green, just like the original 1695 Road & Track cover car and is beautifully detailed Mustang diecast car at 1/18 scale inside and out. Yours will be only 1 of 900 made! Wouldn't you jump at the chance to learn how to drive in this 1965 Shelby Mustang GT350 at the Caroll Shelby driving school? 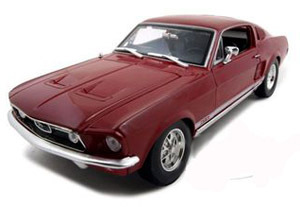 Here's a beautiful Rangoon Red 1965 Mustang diecast fastback just like the cover car featured in the January 1965 Edition of Popular Mechanics Magazine. 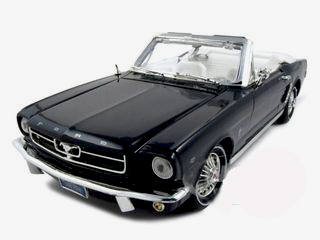 Your pony car, is a limited edition (only 1,500 models worldwide), 1/18 scale wonder, with a highly detailed black interior with a cool looking console, the enthusiast's favorite option. 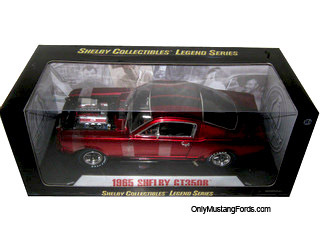 This Shelby beauty, part of the Legend Series, is a 1965 Shelby Mustang GT350R is a very nice quality 1/18 scale car, equipped with a racing engine and decked out in a sleek, metallic red paint, accented with Black Stripes and crafted for detail at 1/18 scale. Here's a sharp looking Dynasty Green 1965 Ford Mustang Convertible equipped with the Ford 289 V8 engine and produced in 1/18 scale. Your car is extremely rare, with a tiny limited production of only 750. 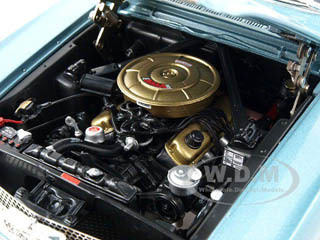 As you can see, the engine compartment is very detailed, and the 289 V8 is painted in the 1965 model year correct colors. Check out this well done red 1966 Shelby Mustang GT350R outfitted with white and blue matching racing stripes in 1/18 scale. Expected details in this race car, are a fire extinguisher, export brace, Cobra style extended shifter and even a fast fill gas tank inlet inside the trunk! With only 999 made, there is limited availability. 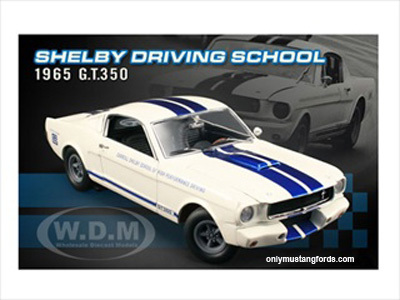 Bet you never thought you'd see a 1966 Shelby Mustang GT350H in a 1/18 scale Diecast Car Model ! You won't see many either. Yours will be 1 of only 999 cars world-wide. Here's a cool and very detailed 1967 Shelby GT500 Convertible. 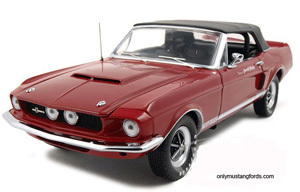 What's unique about this little Shelby Mustang diecast gem, is that it can be displayed either with a raised soft top or as a top down cruiser, complete with Shelby's iconic roll bar inside the detailed interior. Purists, will appreciate the detail even in the trunk area including factory correct patterned vinyl trunk mat and other small but important details that you don't often find in good or top quality diecast cars. One of the most coveted and quick Shelby Mustangs ever, was the incredible Many think the 1967 GT 500 Super Snake is the best Shelby Mustang ever produced. 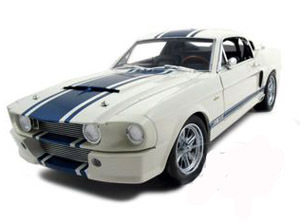 This amazingly detailed model is painted White with authentic blue stripes and crafted at 1/18 scale. Connoisseurs will notice the rare and optional Paxton supercharger tucked under the hood. Claim yours quickly before it becomes someone else's reward. Want a wild Pro Street 67 Mustang fastback ? 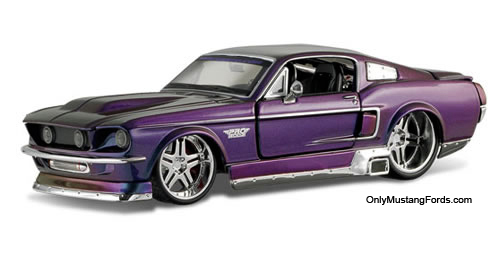 This diecast 1967 Ford Mustang GT Pro Rodz car would look great at any car show, especially with that cool mystic paint. Are those 22's in the wheel wells ? 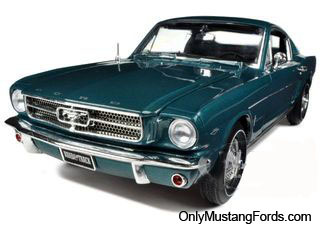 One of the more rare cars for the 1967 model year was the Fastback bodied Mustang GTA . Yours is painted in an authentic Red, with factory fog lights and GTA body stripe above the rockers. 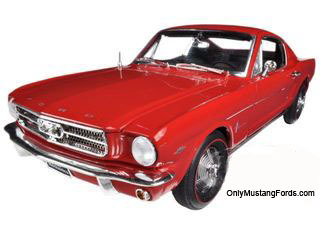 Rangoon Red all new 1967 Ford Mustang GT. A 1/24 scale masterpiece by Maisto.